Association General Liability Coverage with $1 Million per Occurrence and $5 Million Aggregate. A comprehensive manual considered the “Bible” of officials association leadership and administration, delivered directly to your association’s designated key contact person. Bulk-buying opportunities for officials training resources with discounts of 45% off. 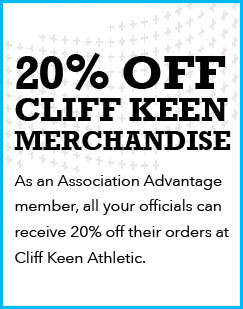 Your entire association membership receives an exclusive 20% discount on all online purchases from Cliff Keen Officiating, the official sponsor of Association Advantage. Provides financial, tax, legal and administrative general information and consultation on issues pertaining to your association. Coverage included for the association and its board and committee members for coverage up to $1 million per occurrence and $5 million aggregate. General liability provides coverage for claims for bodily injury, property damage and personal injury. Provides coverage for alleged officiating-related errors and omissions that result in a claimed financial loss but there is no bodily injury. Takeaway: Necessary insurance coverage to protect your association & board for activities, camps, clinics and training.